A fantastic effort by 8 of our U10’s saw them walk off with medals all round and the Silver Plate to confirm them as our most successful U10’s girls team yet. 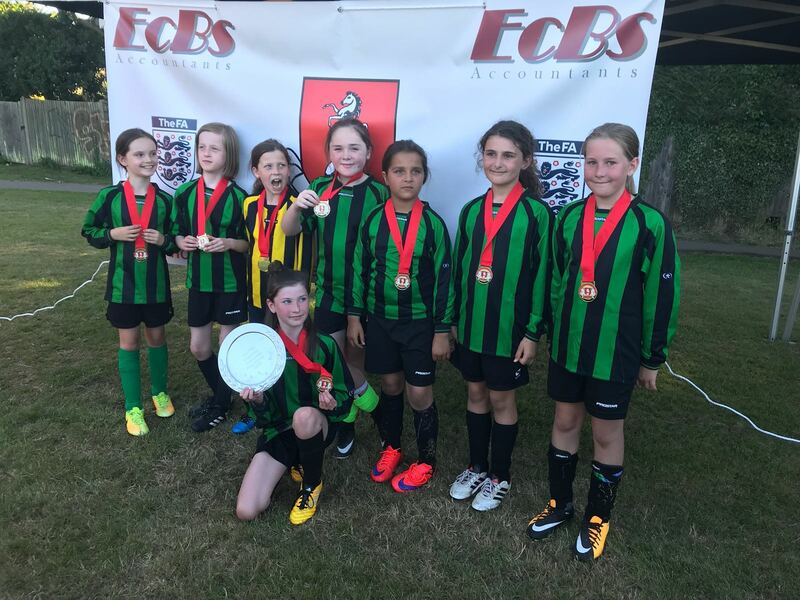 At the Tunbridge Wells/Ridgeway tournament on a hot June day, the team went undefeated in 5 games to get in to the play-off slot for the Silver Plate. Outstanding defence with Mimi in goal and some exceptional tackling by Sienna, a long-range goal from Annabelle saw the team off to a solid start. Eva and Daphne made sure no one found it easy to make ground against the team and Lydia and Sabrina looked to unpick the opposition defences. For the Silver Plate, the sixth game under sweltering conditions, the team rallied and were all solid throughout. A goalless ‘normal’ time saw the tension of penalties where saves from Daphne kept us in the tournament, before Florrie stepped up to hammer the ball in to the back of the net for victory.